5 May 2005 : I woke up one morning and remembered my dream and as I did, some part of me snapped into one section of my brain gently. Then about ten seconds later I woke up from another dream which I also remembered and something snapped back gently into another section of the brain. I had experienced two dreams running concurrently, originating from different areas of the brain. Which makes me wonder-how do we know both sides of the brain don’t have different dreams simultaneously? I don’t know but I don’t want a simple answer I’d like the truth. One time, when I was less busy many years ago, I could remember most of the night’s dreams and had a friend who also could remember his night’s dream activities. When I mentioned I saw him in my dreams the night before, he mentioned the part in his dream that night which matched mine. It appears we’d met up spiritually in some twilight zone of the subconscious. 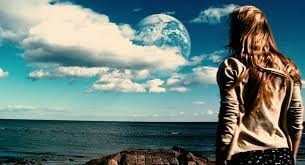 Personally, I believe that there is no one particular place where we all go in our dreams (like the astral world as some say), as I have been to many worlds which differ from each other. They appear to be different dimensions and each part of our soul seems to have its own abode, but I’m not an expert. It’s possible that two different aspects of my soul have different lessons to learn which can’t be achieved in the same dimension. But nowadays I don’t usually recall my dreams as I’m trying to focus on this world because I need to be present here here to earn my living, and I find it equally as interesting now as I did found my dreams years ago. When I did remember my dreams I was working as a signwriter so my mind was free to reflect all day long on the night before. However, I can’t with my present job as a support worker for the seriously injured as I interact with others all day and it takes my mind off myself. It’s a matter of understanding what you find in each world and categorising it to locate it again later for me, but then (when I did remember most of the night) I found this world empty of excitement, but really it’s all determined by what experiences are used to interpret it. Twenty-thirty years ago I knew nothing about this world, so the dream recall was to make this life more interesting from thinking about it as I lived a dull life, but created a busy mind to make up for not doing much. Now I enjoy this world, so use my mind more to figure out how it works. One morning I woke up early from a lucid dream, but it wasn’t a real dream it was really me in the astral world, but the higher sections where things don’t shape-change but they still have colours just slightly more vivid than our world which distinquish it as the astral world, rather than the parallel universe where things appear translucent and more etherial. When I woke I didn’t open my eyes as the scene was so vivid I wanted to keep it fresh and investigate it further. I was up above what appeared to be Bermuda and standing there beside Jesus. Then Jesus said to me very clearly – Please remember this event very well, as a very dangerous experiment is being done by the US govt and Atlanteans and it is causing far reaching damaging consequences, which the experimenters are unaware of. I was probably as high as where the clouds start, as this is the ground of where the etheric world as a separate evolution to us begins. I looked down on the astral counterpart of Bermuda and it appeared to be about the size of a dinner plate below. Beside us was a man-made metal object which was an upside down saucer shape and appeared to have some sort of transmitters underneath facing Bermuda. It was apparently cloaked in the physical world so nobody could locate it. It was like a satellite in that it stayed in the same spot, but I think some transmitter under the sea locked it into the place it operated from. I’m not sure but possibly magnets were involved. There was a tube of astral energy going down from the transmitter which looked maybe 3-6 feet or 1-2 meters wide. It wasn’t swirling like water going down a plug hole, it looked as if it was some kind of vortex between that transmitter and the one undersea, but it had a very powerful magnetic pull and it seemed as if it was pulling apart the atoms of ‘earth reality’ space in the section from the sky transmitter to the undersea one. I don’t really have the words or technical know-how to describe what was going on, but all I can say is ‘our reality’ (as described by Bruce Cathie the New Zealander who discovered the harmonics of our 3D reality comprises interacting vibrations. See: http://www.angelfire.com/nm2/aona/gridlines1.html) was being fragmented in a vortex from this satellite to the transmitter undersea. Basically as far as I can describe, this ‘wound/gash’ in our reality, was part of a set-up to break up the forces which comprise gravity above Bermuda. The ultimate goal being to allow parts of the continent of Atlantis to slowly rise up from the ocean bottom in a way nobody ideally would notice, by making it look as if it was a natural upward movement of the ocean bottom, adjusting to earthquakes or volcanic activity. However, it was shown that Atlanteans still there for thousands of years, were working with the US govt to allow them to surface and live in our sun and air again once their abode surfaces as an island. They had all their technology and undersea civilization according to how they wanted and didn’t want to have to create a new one and they also wanted to remain in the same spot, because of the energy of the Bermuda Triangle. Though I’m not sure what relationship that is, I think these Atlanteans have activities operating within the Bermuda Triangle they need to continue. One day, I was sitting down relaxing and I felt some invisible fingers fiddling around inside my head. It was the top right brain in the centre. I thought: it is so obvious that someone is fiddling with my brain from another dimension, now what do I do about it, though it appears that they know exactly what they are doing, and it is not hurting me. Many times before, I have felt expert bio-engineers manipulating my brain, from the next dimension. Though, I am sure I don’t have any alien implants or anything, it was a stimulation of the cranial nerves and activation of specific brain areas. I do believe that everyone who thinks a lot, has this type of activation, from the guardians who are in charge of our levels of consciousness. As far as I know, it is just routine maintenance performed on people in general, by earth’s divinely appointed rightful evolutionary guardians. So I sat there and asked: WHAT ARE YOU DOING EXACTLY? And a very clear voice said: WHAT DO YOU WANT ME TO DO? I thought, Ok I’ll answer this and gave a very long detailed list of improvements I’d like for my brain. I guess not everyone normally has a list of these requirements handy, but I’m so hyper delicate that every time I do something, I can feel every cell in my brain creating activity to do with whatever section it uses. So I reeled off a long list of requirements and by the time I had finished, my consciousness had gone right into the ‘person?’ that was standing over me. IT WAS ME! I was in the future, and don’t know if it was millions of years or even billions, it was indeterminate. But I had a transparent body and of normal human shape and androgenous as far as I can tell. I could see right through the flesh and the veins had blood flowing in them which was like a rainbow. But it felt nice and as if it was the consistancy of real flesh. It didn’t look scary though, just like a transparent tropical fish. I think this future aspect was amused at being ‘caught’. I think it was positioned in the World of Abstract Thought. Anyway it was quite exciting to know how some parts are in the far future and that we can come and improve ourselves from another time and space, with great sensitivity to what our biological requirements are and be in tune with our present capacities. I’m presuming here that I am not the only one who is in contact with some more perfected aspect, which I just happened to sense coming by to visit little Nicky! One day I was walking down the street and all of a sudden my consciousness ‘became’ me in a body the size of earth again. Only it wasn’t above earth, as in my encounter with Jesus, I was above Venus. I looked down on Venus, (experiencing myself as a big sphere again) and saw hundreds of cords leading down to parts of myself which have lived at one time on Venus in past lives. I looked over at earth next door and saw only a few lines going down, from the big sphere hovering above it, which was obviously also myself, though the Venusian one enveloped it as it moved to look over earth. I knew that I had spent little time on earth, compared to Venus, yet I’d been on earth since it was created. hmm So in fact I’d be a long term Venusian if I had to say ‘who am I?’ for this solar system. One evening I was lying down and I felt some fingers fiddling with my brow chakra. I swear I could feel their breath on my face, as their face was a few inches away from mine. They were doing some major surgery, or some more bio-engineering. I have felt this ever since the day I joined the Rosicrucian Fellowship in 1975. Even though I left 10 years later, they still fiddled with my spiritual vehicles, chakras, brain, optic nerves, you name it they may have fiddled with it. I said to myself, does this guy actually believe I’m not going to know he is there? How could he miss my thoughts by telepathy? It bothered me that he continued even though I noticed and so I prayed hard that I could see the face of this cosmic surgeon. Suddenly a light from somewhere shone just on his face and made it show up as in daylight. I looked into his green eyes, only a few inches away from my face and examined his freckly round face and wavy sandy hair. I was relieved he wasn’t some demonic creature. He looked back at my eyes and the shock on his face was priceless! I can’t believe he looked like a normal human, but he did. Then I heard the word Jupiter. Maybe he is a Jupiterian, I hope so because I always feel I live on all the planets in our solar system simultaneously. But then I think so does everyone else. This larger me seems to be everywhere. Obviously this destroyed everything I ever believed in again, so had to start figuring out the meaning of life again, but it all adds another piece to the puzzle. I was wondering about things in a deep questioning mode and prayed to God/Jesus for BIG answers. A man with some other men, (who were human) sat at the controls of some computers at a headquarters in the centre of the physical galaxy. These computers were able to access every single thing to the smallest detail on every SINGLE planet in our galaxy, including being able to measure the brainwaves of anyone on any planet. Everyone was bringing about activity under strict orders from God about what was needing to be done on each planet to bring about perfection in this galaxy, and this galaxy in relation to other galaxies. So that the entire universe is run according to a plan which is perfect in every detail. This man I saw was completely obedient and did not alter a single instruction and I knew upon giving it much thought later that the fallen angels were in charge of the etheric counterpart of this control centre and were SUPPOSED to follow instructions but actually did their own things and this is why the universe fell into disarray and a domino effect took place down the various lifewaves. Except that the animal kingdom didn’t fall, which is why they were sacrificed in the Old Testament, to send a running wave forward through all the lifewaves until it reached back to God again to restore the flow of creation. Rather like a ball bouncing back, only when Jesus died He sent a massive forward wave back to God from the human life wave, which in turn would give the angels, and archangels etc the right motivations to regain their lost estate. I had a strange experience a couple of weeks ago (June 2007), then about half an hr later another one. I need an hr or two to write it out, but basically I experienced myself in NY in the parallel universe. There was a trampy, possibly homeless guy, and possibly a methampetamine addict sitting cross legged on the sidewalk in the cold with a hat or something in front of him, croaking feebly ‘help me, help me, help me’. He was starving and sick and had withdrawal symptoms. The whole universe apparently knew about him, as I experienced in that realm intelligences from other planets looking on concerned at his welfare, and I was invisible, but in my (me looking) body and I was touching people’s hearts as they walked by and poking them deep activating some kind centre, that would make them feel they could give him money or a bed for the night. I knew exactly where he needed help at some hospital and was liasing with the staff there about what they could do spiritually to get him inside for withdrawal treatment. I was going to poke a 1000 hearts if I needed to. I had eternity apparently and wasn’t going to stop until he was helped. I am sure he did get help, some rich guy came and got him in hospital and he was OK. But he was prob worked on by others to do this. Strangely the parallel universe was bathed in a beautiful golden light and things looked clearer in our world, than we see them. More translucent and more alive looking. Phew! Then after digesting that– suddenly I was transported, or rather my consciousness still in the parallel universe was transported to a middle east country, which seemed to be Saudi Arabia near Mecca. There were all these guys sitting around in their long dresses (galabayas) sipping tea, in a large tea room playing board games like chess etc and generally wasting their lives by being concerned about trivia and arguing now and then about people they knew. They had absolutely nothing to do and were depressed. I was standing invisibly in the middle of them in a courtyard projecting images which were stimulating into their minds from a machine that sent images of what was happening around the planet in real time into their minds, even though they were oblivious. It was just a record of what they were missing in life. I presume I was a drone just doing my job in the parallel universe. But I think the real purpose was to lift the conversation away from gossip about each other and to broaden their minds, so if something came on the TV they would take more note, than if they were entirely ignorant because it was already sent to into their subconscious. Though I think as time is different in that world, I may have been the same person doing two different tasks. I’m not sure I could cope with having too many aspects of myself in the parallel universe. However nothing surprises me anymore about anything as life is already complicated enough. Gosh what trouble our guardians go to to ensure we evolve. Hopefully I will be able to write more on these experiences. But I remember similar kind of experiences in a past life. Just go to my past life story: Sembe remembers the parallel universe. September 2007. Recently I woke up from a lucid dream, but really I was just aware of just coming back from the parallel universe, rather than the astral world where people normally go for their dream experiences. But I heard sounds in my ears as if they were like physical reality sounds and after much investigation I found out they do speak like we do in there. I thought it was all telepathy, but no they do use their ears. This is a good bit of data for me as I often hear someone calling me in my ears as if it’s real, but there’s noone there. I think it’s friends coming to get me in the parallel universe to do some helping work. Because time is different there it may be happening in our now, but years differently simultaneously in relation to our now, when you are in there. One time at least 20 years ago I woke up in the middle of a lucid dream, but again it was in the parallel universe, and I was waking up Israelis in Israel to get out of their beds and move as someone was going to bomb or nuke the city they were living in and they had to have a visitation from an “angel” to warn them to leave their home. My hand materalised and touched them to wake them. But I knew it was in the future as there was absolute utter panic and fear and chaos sweeping the land as already some bad things had happened in the mid-east. Certain people were warned, but not others. Not sure what the requirements were to have a warning to save their life, but I expect they had good karma. I really can’t tell if a nuke did go off, but there was utter pandemonium in the astral world, with fear being the strongest emotion. It’s possible it happened on an alternative timeline, but it was one of the worst things that have happened on the planet and very dark forces were behind it to destroy Israelis and Israel. Like they were trying to make it uninhabitable for hundreds of years with radiation. I think it was more an attack on Jesus’s birth country, to try to get back at Him. Dec 31 2007. Another experience in the parallel universe has been remembered. I saw an Indian woman (in India) and her son, who looked about 8-10 huddled in a corner of a street desperately hungry with nowhere to go and crying out in emotional pain. They were huddled in an old blanket and the little boy had such a fearful look on his face, it was heartbreaking. Anyway I was seeking help for her to locate somewhere to live, a job and a food supply. I felt so sorry for her I just knelt down next to her and put my hand on her forearm to give her some vitality and energy. I had arranged for some Catholic nuns to go by and offer help. This was arranged by the angels who run the church. I know I made sure the lady on the street had a good job available, which I think was sewing. She really felt she was going to die, but Jesus cared and sent help. What appears to happen in the parallel universe, is humans who are able to be conscious in their etheric double, look for people who are desperate and crying out in pain, or who are going downhill fast with addiction or living an unpurposeful life. They go to the angels who run help agencies, individuals who have the means to help or those citizens in the parallel universe who have charge over mentally stimulating technologies. They then follow instructions to do their bit as a cog in the wheel of progress of humanity evolving upwards, where everyone can get help eventually, as long as the source of help asked will listen and act on what they need to do. They need to follow the instructions of the angels who run their agency in the parallel universe and find the person in need. This is further reinforced by urges from their own guardian angels to go somewhere or contact someone else who will do this. I guess not everyone is helped and maybe they are expected to eventually turn to God to ask. In that case, many hands are on board to answer the prayer and this includes extra-terrestrials who are conscious in the parallel universe who wish to add their skills to help us eg doctors and healers. But to be sure every person on the planet is watched carefully and their needs are noted. [Dec 2007] A friend of mine had an operation and I prayed for him. Afterwards I experienced myself working as an invisible helper in the World of Abstract Thought and I saw myself working on his body and aura for days, starting at the head. I was harmonising the chi energy through the meridians of his body and making sure the alignment of all his spiritual vehicles were in balance with this work. Making sure the chi went through all the spiritual bodies simultaneously. It was detailed work, but my eyes in that spiritual body could see the person as if they were transparent. I have felt invisible helpers doing this to me a lot. This is interesting as I also work on harmonising the world gridlines in the etheric world/parallel universe. I’ll excerpt a section from my past life story as Sembe the Persian time traveller, who experienced himself in the parallel universe as a drone. However he did managed to get back in again, as ‘himself’. Once he [Sembe] was sitting on the tower and felt he was not alone. He could not see anyone with him but he sensed their outline and was asked by telepathy to lie down and be very still. He was not ready for this experience but had so many questions that didn’t have any answers, that he was getting mentally disturbed, with knowledge building up in his subconscious and it needed to be free to clear the build up of electricity in his nervous system. He lay down obediently and then he felt a jolt on the soles of his feet, the palms of his hands and his spleen that was artificially induced. A double of himself sat up and was helped to his feet by some people from our solar system in jump suits, that he at first vaguely recognized. They were etheric people and they were in a parallel universe. He was told that two of them would make sure his body wasn’t disturbed as it was dangerous to move the body during this experience. He forgot who he was immediately and lost consciousness of himself as the person Sembe. Later in his lives to come he lifted his physical consciousness into his etheric brain and became more aware of himself as an individual in the next world. But at once he was familiar with his work in the solar system as a scientist and he worked on every planet. He got into his spaceship and moved to the other side of the world where the sun was shining. It didn’t look like the hot yellow sun he knew. It was multi-coloured and its rays reached to the end of the solar system in myriads of intricate patterns – weaving a structure of enormous proportions that contained all life within it and designated their boundaries. The ocean too was multi-coloured and looked like sparkling glitter. Each drop of water in the waves was surrounded by a light as if it was alive. The ground was transparent and the crystals and minerals underneath were clearly visible. Many different entities moved through the air, many different faces and forms. He went up into the clouds and saw intense fires made of light that pulled on people living in the physical world in their souls. The emotions of mankind were weighed and sifted until they reached a certain level and when they did other more powerful entities embodied them and pulled them through the bodies of those they belonged to. Everyone’s brainwaves were measured and certain people were concentrated on by teams of experts until they had invented something that was needed. People’s bodies were measured to see how much of the four ethers were there, so they could plan ahead fortifying weather conditions to invigorate those prone to complacency and give them a fighting spirit. They had the world in their hands, they decided which forces would build up in the souls of mankind and be released and changed to another form. Sembe didn’t know the part of him that lived in his unconscious, that knew these things and lived a separate reality as a citizen of all the planets. He was always told his task for the night by those who were themselves following orders, so that the solar system is synchronized, in its distribution of energy for all citizens. He knew what he was doing. He knew all the parts of earth that took in energy from elsewhere and all the places that released it in a precise pattern of leylines. Everyone had to make sure that no entities from inside the world in the lower regions of the etheric world interfered. Their needs were deeper and required more satisfying. Those earthy pursuits that some races still indulged in and caused desire energies to be expressed were always in demand by those stragglers that were never satisfied, and always needed the extra passions of those that were more intense than them to feel satisfied. Being closer to the core of the earth made their bodies denser and therefore earthly desires were more deeply rooted in the earth mother’s body. 9 Jan 2008: Something weird happened the other day. Suddenly, I was transported in consciousness to an underground base under the Atlantic Ocean. Looking at a map, it seems off the coast of N and S Carolina or Georgia. But possibly 100 miles or more out from the coast. I’ve have experienced this place numerous times, but this time it’s as if my mind was sent into someone’s body and I saw through their eyes as real as if they were mine. I was inside some large round tunnel possibly about 12 feet across, lined in what looked like stainless steel. It looked very professionally designed, and I’d say someone with very good architectural skills has tried to make it as professional and modern as possible. It was not unlike a subway station. There were occasional dark stripes down the walls. I saw a man standing in a crisp white (looked like cotton) uniform, with a dark military cap on and it appeared dark epaulettes. Possibly gold buttons, but I can’t be 100% sure on the buttons. Possibly some minor metallic adornment. It all happened in about two seconds, so I couldn’t observe much. I’d estimate they were American or German. I can’t be 100% sure, but there may have been painted pictures and photos on the walls. One thing is for sure the place had very bad vibes and I never want to go there again. This weird experience where I am like a physical body being somewhere has never happened before. However, this underground base experience felt as if it was very firmly ‘present day’. I put ‘stainless steel underground’ and ‘white uniforms’ through google and some covert military things came up, I saved them but I haven’t read them yet. I feel too weird to digest what it all could possibly be. (19 Jan 2009: A year has passed and I think I know what went on here. I’ve seen in the news that Germans were buying large amounts of stainlesss steel. Nothing else has happened regarding this apparent simultaneous life existing that my twin soul is living. However, I don’t think I need to be drawn into this dark reality again, and two seconds is more than enough time to know what shady goings on my twin soul is connected to. He does have a universal higher self, [called his Divine Spirit in Max heindel terminology] which I experienced recently, but is not allowed to let it come into his consciousness until he has paid his karma). 7 Dec 2008. I’ve experienced another couple of times in the etheric world/parallel universe. In the first one I was measuring the pain of wounded vets in an American army hospital in US on a meter to go on some karmic records. Unfortunately I forgot to write down more details at the time, but it was in the eastern half of America, and possibly I was doing this at more than one army hospital. Men were wounded and some had missing limbs and the whole room was filled with the pain energy, and not just physical pain, the pain of losing power. As I was just a drone I just put a meter next to those areas on the body that emitted the most pain to catalogue how strong the pain was and where it was coming from for each person. Some other person was cataloguing the person’s matching thoughts. Not sure if it was a human though, may have been an angel, but not sure. He had some gadget to record multiple thoughts in the person’s head to see which ones dominated over another, from varying aspects of the person’s personality and spirit. Then on the second occasion I experienced myself as a drone in the etheric world, I was putting up a barrier to some impending darkness spreading around South Africa, and was in what appeared to be Durban and putting a barrier around a church to stop it entering inside. I think it was the darkness of fear. But anyway I did live in Sth Africa and it felt as if every square inch was filled with fear in 1975 during apartheid. I am only told what to do by angels, as I am not fully conscious but do menial tasks which require measuring. I think a lot of people live a parallel life doing useful stuff in that dimension, but only if they get the task right. Better than doing nothing I guess and good experience to help others. It would be horrible to think I was only indulging my fantasies to live in hedonistic luxury, and surrounded by beauty and entertainment while I slept. However I’m sure I probably do a lot of that in the astral world, but at least in the etheric world I’m ‘apparently’ able to control the desires of my senses. The two worlds (etheric world and astral world) are poles apart with the astral composed of shape changing substance, but one day I wish I could wake up from the astral world knowing I’ve been able to say no to myself, as I feel I get carried away in the astral with a lack of self discipline. But it’s hard if you don’t have all your mental self-control with you and just your desires motivate you. But angels do watch to see what you do without your mind as a brake, as your true intentions stand out in the astral. That way they can work out what life expereinces we need to whip us into shape before we do something silly from lack of self-control in one area of life. Some people can’t control what they say, others what they do, or think, or they spend too much or gamble. Maybe some eat too much or drink too much. It can be hard to say no to yourself, but always we have spiritual help to get a grip on these out of control urges even if we aren’t aware of the unseen help that has been given. 10 Jan 2009. Last night I had so much electricity in my body it was like I had epilepsy, but then suddenly I was aware of myself in the parallel universe again. Another reality in the parallel universe opened up and I saw myself working in there as a drone again. I was in an American army tent with assorted men relaxing standing, sitting and lying on their beds, mainly reading letters from home. I was assigned to one man with a deep tan and wavy sandy hair who needed help connecting with his loved ones from home in USA. As I am invisible the physical people I work with am unaware I am present as I’m in the etheric world. It was in northern Saudi Arabia, and may not necessarily have been in this time frame as time is different in the parallel universe. The man was lying on his camp stretcher and reading a letter from his family in USA. He was emitting a sentimental, homesick energy with travelled through the earth back to USA. I’m not 100% sure but it may have been to Washington State or Oregon. (I’ve been to those states which is possibly why I am familiar with that place energy.) His heart was emitting sentimentality within a clear round tube of energy which was approximately 45mm diameter. It appeared to be light pink, and light gray and cloudy. It travelled down the tube and reached his family. My job as a drone was making sure his heart chakra was unobstructed. I then went through a wormhole and distributed his emotion to the family members he was directing it at. When it passed through the earth and emerged the other side to his main family member -his wife, my task was to branch off smaller tubes to reach other people he had directed it to which he had intended his emotion towards, eg brothers and sister, parents, children. I had to plug the tube into their hearts, not unlike plugging the hose into the vacuum cleaner but making sure it was in securely, otherwise the airflow would be leaking or his feelings would escape. The soldier then saw a photo of his son who was a toddler and he became overcome with paternal instincts, guilt for not being there to watch him grow up and desire to hold him. His spleen gushed out copious supplies of a golden substance which was like etheric liquid tears. It was covering an area of about a fist on his spleen chakra and dripping slowly down his torso. My job as a drone was to collect his spleen emanation and put it in a special container to give to angels, who it appears stored it in his special place where everything is saved from life to life for future usage by him. I do not know what happens to special energy we produce from profound feelings, but it is saved as it is apparently very valuable and gives people treasure in heaven they can draw on later. After he completely finished his secret emotional crisis and put away his letters and photos to occupy himself with other soldier emotions, I left him to go back to my station where I am instructed what to do next. I feel much better getting that out and it seems the barrier between me and the etheric world is thinning. At least I hope so as it is very satisfying have an alternative to this 3D reality to be aware of.